On Sunday I shared with the congregation about my experience at the Parliament of the World’s Religions in Toronto, Canada, where I was last week. I spent an entire week attending plenary sessions, workshops, movies, exhibits and concerts—all having to do with the various religions represented—which numbered right around 200—and the importance of religious people gathering, welcoming one another, and working together to address some of the world’s greatest challenges, including racism, intolerance, violence, hunger, global warming and environmental destruction. One of my favorite exhibits was called the Quilt of Belonging—definitely the largest and perhaps the most striking quilt I have ever seen. It is 120 feet long and consists of 263 blocks, representing all of Canada’s aboriginal groups and every nation in the world. I met the lady who came up with the idea and oversaw the entire project. Her name is Esther Bryan. She started the project in 1998 after a trip to Slovenia with her parents. Her father had left that country after World War II, and they went back to find the home and family he had left behind. During that trip she recognized that everyone has a story to tell and each person has a past and a place that forms who they are today. As she thought about all of the indigenous and immigrant people of Canada, she began wondering about an art project that would truly represent everyone in the country and give each person the opportunity to find a place and sense of belonging in the overall design. Esther was there at the exhibit and I visited with her for awhile. She told me that every square in the quilt was designed and created by someone living in Canada who was either a member of their aboriginal group or a person who came from another country. She asked each participant to make a square that represents their country and tell the story of their home! She finally finished the quilt seven years after she started it, along with a book of all the stories! Esther created the quilt as an expression of hope—a vision of how the world can live in harmony, as it recognizes diversity while celebrating a common humanity, demonstrating that there is a place for all to belong. I tell you about the quilt because it was, for me, a symbol of the entire Parliament. All 7,500 of us came from different places in the world—including a number of us from Hawai`i. 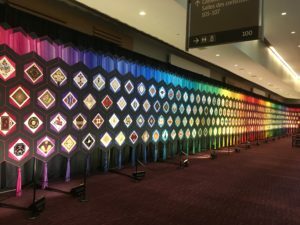 After seeing the quilt and hearing all about it from its creator, it occurred to me that every single one of us has a place we came from and a story to tell about it. Every day, I listened to dozens of speakers talk about where they were from, the faith they learned in those places, their convictions and their concerns. One of my favorite speakers was Dr. Izzeldin Abuelaish. He was born and raised in a refugee camp in the Gaza Strip. From elementary school through high school, his entire education was in refugee camp schools, while living in poverty. He overcame seemingly unsurmountable odds during his childhood and early adult year and he studied hard enough to receive a scholarship to study medicine in Egypt and then got his MD in London, as well as a master’s degree in public health at Harvard. He was the first Palestinian physician to receive an appointment in medicine at an Israeli hospital. He has dedicated his life to promote healing and peace throughout the Middle East and the world. Part of this mission was to tell the stories of war and violence between Israel and Palestine. During the 2009 Gaza war, an Israeli tank fired on his home and killed 3 of his daughters and his niece. This was just 4 months after his wife died of cancer, and he and his daughters were still grieving her death. Immediately after the shelling, Dr. Abuelaish went into the room where his daughters and niece had been just moments before, he saw their body parts all over the room, and he knew they were all dead. He was scheduled to speak live by phone on Israeli television just a few minutes later. He decided to keep his appointment, and he told the story of what had just happened. In tears, he described the horrific scene and cried for help. After moving to Canada, he wrote a book called I Shall Not Hate. In the book, he writes about dedicating his life to peace and conflict resolution in the Middle East, in memory of his daughters. Also in their memory, he founded Daughters for Life Foundation, which provides scholarships for young women studying in the Middle East, regardless of ethnicity or religious affiliation. Dr. Abuelaish is a Muslim, and he attributes his positive attitude and commitment to peace, forgiveness and reconciliation to his Muslim faith. This is just one of the many stories I heard at the Parliament. I will be sure to share more of them with you in the coming months. In the meantime, I invite you to listen to my sermon from Sunday, order Dr. Abuelaish’s book I Shall Not Hate, and check out the Quilt of Belonging.